The other week my husband chucked a copy of “My First 100 Trucks” into the shopping trolley at Sainsburys. Since then our son has become increasingly fascinated by all things vehicular. Perhaps his preoccupation with the animal kingdom is on the wane, and engines and wheels have taken over from wings and tails? Certainly, I have noticed that he is more excited by the sight of the X47 bus out of the window than by passing dogs, and even the highly entertaining frolics of the St Bernard puppy who we look out for every morning are overlooked if a fire engine is passing on the way to the airport (which seems to happen with alarming frequency). Imagine his excitement therefore, when we went to Ouseburn, a Newcastle valley framed by a series of vertiginous bridges, across which trains thunder their way to and from the city centre. He could have easily sat in the shadow of the bridges pointing up to the lofty locomotives all afternoon. But this is not all the valley has to offer. Continuing the theme of urban options for days out, Ouseburn is one of Newcastle’s quirkiest areas, cradled somewhere in between the glitz of the Quayside and the grit of Byker, where pubs, industrial warehouses and artists’ studios sit side by side. 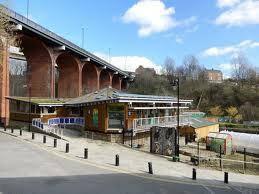 Named after the tributary of the Tyne which runs through it, Ouseburn is a unique part of town. Where else would you get a boutique hotel, a horse riding school, a renowned music venue, a village green, a farm and a centre for children’s literature? Once we had managed to tear our son away from his Metro-spotting fun, we headed towards Seven Stories. The building, a renovated Victorian Mill, is currently hosting exhibitions about Jacqueline Wilson and Julia Donaldson. Now, I am familiar with the former as a writer who has helped many of my younger female students negotiate the rocky path into adolescence through her popular “tweenage” fiction. The latter however, wasn’t really on my radar until last year, when I had a baby. Now her books are strewn all over my house, the audio versions congest my ipod, and her characters have taken up permanent residence in my brain. Even my bibliophobic husband is not immune, and can recite all of What the Ladybird Heard without as much as a glance at the text. The fourth floor of Seven Stories has been temporarily transformed into a sort of shrine to Donaldson’s imaginative genius and prolific output, with a Squash and a Squeeze house, a Cave Baby cave and, most popular of all, a giant Gruffalo. It was surreal seeing the characters whose voices I adopt every night blown up to giant proportions all over the walls and floor of the interactive exhibition space, and more fascinating to learn about the inspiration behind them and their brilliant illustrations. On the top floor, (the seventh storey), young and old alike can listen to story time, explore the dressing up box or curl up on a purple leather sofa with book. Down at the “Creation Station” in the basement there was a Blue Peter style chance to make an aforementioned eavesdropping ladybird, but given that our one year old’s fine motor skills don’t yet stretch to cutting and sticking, the task fell to us. I was transported back to Primary school by the smell of the Prittstick and the feel of the crepe paper. It was really very therapeutic and everyone should try it. As well as the exhibitions, the building is home to a cafe and a rather wonderful bookshop. Elsewhere in the valley, just a short walk from Seven Stories, the Ouseburn Farm is also worth a look. Pigs, goats, chickens and quails are all there, whilst cows and horses graze further up the hillside. After that, you can walk along the riverside. Our son was enchanted by the ramshackle collection of boats, but less impressed by the ducks. Animals? Meh. Motors are where it’s at now. A distant rumble, and our little train-spotter’s ears pricked up again…it was back to the railway bridges, after a lovely time in one of our region’s most eccentric little pockets. This entry was posted in animals, architecture, books, shopping, walks by alongwaytogoforacupoftea. Bookmark the permalink.